Scientists started finding fossils of ancient sea creatures long before they even discovered dinosaur fossils. This was because the shallow oceans did not cover many of these creatures’ bones because of the continuous moving water and low level of erosion kept much better formed aged fossils. The Cryptoclidus was one of the most common dinosaur age sea creature found and ultimately the most interesting. Cryptoclidus’ had a very interesting bone structure. It did not have flippers or fins like most ocean driven life forms. It has paddles just like a turtle does. Therefore it could be easily assumed that they did not swim erratically, but gracefully moved like they were soaring in the air like a bird. 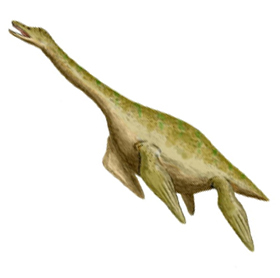 They had really long necks like the Brachiosaurus, so they could grab reach far to grab at fish with the help of their longer pointy teeth. Because of the shape and angles of their teeth scientists mention that there is a good chance that they often dwelled in shallow waters and dug in the dirt a lot. The Cryptoclidus is often mistaken for Nessie (The Loch Ness Monster). In Scotland there is one of the most popular mysteries in the world. It’s rumored that in voluminous flesh water lakes of Loch Ness, there have been sightings of a huge beast in the lake. I always thought that it (Nessie) always looked like a Cryptoclidus. Like any Unknown mysteries there were many horrible quality pictures and many non believers. Still to this day people wonder if the monster really does exist.